These nut clusters also work great with added dried fruit like raisins and cranberries. Why not swap out an indulgent dessert and serve these with coffee and tea instead? *This recipe makes 6 clusters. 1. Preheat the oven to 200°C/gas mark 6. Line six holes of a muffin tin with paper cases. 2. Place all the nuts in a large bowl. In a separate bowl, combine the honey, agave syrup and vanilla. Pour the wet ingredients over the nuts and mix together until evenly coated. 3. Divide the nut mixture between the paper cases, then bake in the oven for 10 to 12 minutes, until the tops are lightly golden. Cool in the tin for 5 minutes before transferring to a wire rack. 4. Melt the dark chocolate in the microwave or in a heatproof bowl set over a pan of simmering water. 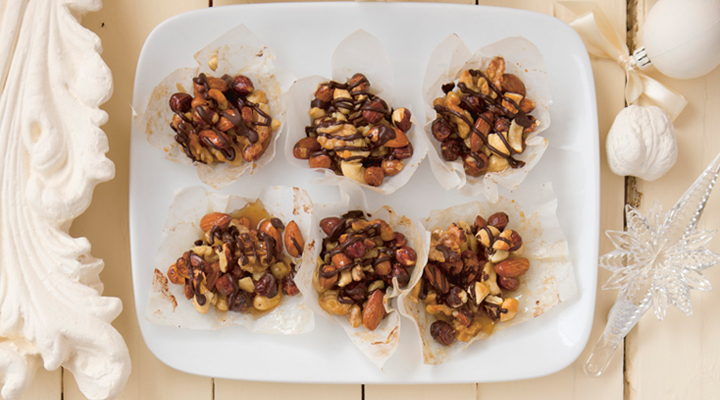 Drizzle over the nut clusters and allow to set before serving.